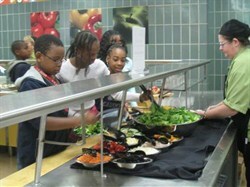 In taking the initiative on a creative food program concept sponsored by the Cuyahoga County Board of Health, the South Euclid Lyndhurst Schools’ food services program entitled “Farm to Fork,” has recently been recognized as a National Association of County and City Health Officials (NACCHO) Model Practice. A letter from NACCHO in Washington, DC, dated March 13, 2013, reads that the SEL Schools’ Farm to Fork program ‘demonstrates exemplary and replicable qualities in response to a local public health need [and] reflects a strong local health department role, collaboration, innovation and has demonstrated its value through evaluation.” Specifically, this program reflects years of thoughtful planning, securing relationships with a local farm, and implementing the program, all for the enhanced wellness benefits for our students. Application for this award has been an involved process which began approximately two years ago, when SEL Director of Business Services, Chad Welker, agreed to be the first school district in Northeast Ohio to implement the “Farm to Fork” idea in our district, in partnership with the county. The program establishes a relationship between the district and Red Basket Farm, a local farm nearly 60 miles away in Northeast Ohio that provides fresh produce on a regular basis. The produce is then made available to the students in the form of salad bars that currently exist at each school building in the district. Additionally, the district has also secured more than $40,000 in grants from organizations such as Whole Foods, the Cuyahoga County Board of Health and the American Dairy Association, who value the leadership our schools have taken in this wellness initiative. Because of this nationally recognized program in the SEL Schools, district officials such as Welker and food services coordinator Kevin Needham, have presented at major conferences such as the Ohio School Board Association and the State Farm to Fork forum. To win the NACCHO Award, a public school program is recognized as a ‘promising practice’ after its first year of implementation, and then elevates to a ‘model practice,’ following its second year. The SEL Schools wishes to equally thank its partnership with Alison Patrick and the Cuyahoga County Board of Health in this effort. Congratulations to the food services program at the South Euclid Lyndhurst Schools!